Foggy on your cloud jargon? We’ve got you covered. Solutions Review’s A to Z cloud computing IT glossary has definitions for 50 of the most popular cloud computing terms and acronyms. 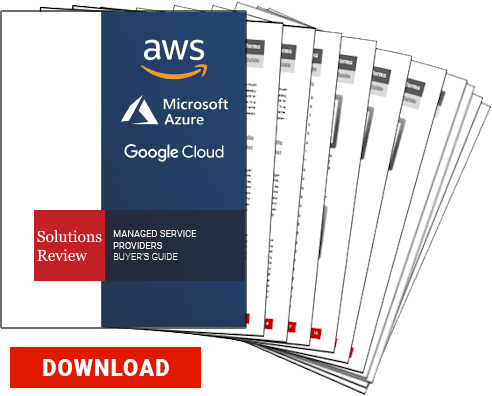 Don’t forget to check out our 2016 Cloud Computing Buyer’s Guide for a complete market overview of the top 28 cloud service providers, available for free here. Amazon Web Services (AWS) – Amazon Web Services is a suite of cloud computing services that make a comprehensive cloud platform offered by Amazon.com. AWS offers over three dozen cloud services spanning the IaaS, PaaS, and SaaS models of cloud computing, and is the most popular cloud service provider, with nearly 30% global market share in cloud IaaS, as of 2015. Well-known AWS services include Amazon EC2, Amazon Elastic Beanstalk, and Amazon S3. Application – An application is a group of computer programs designed to allow a user to perform a set of functions or tasks. Application Programming Interface (API) – An application programming interface (API) is an interface that allows the user to access information from another service and integrate this service into their own application. Through a set of defined requests, the asking application is allowed to access limited pieces of the called upon application’s functionality. APIs are used to share limited functionality between programs. One example of an API is the Facebook share button on this page, another is Yelp’s use of Google maps to display nearby restaurants. Backend-as-a-Service (BaaS) – Backend as a service (BaaS), or mobile backend as a service (mBaaS) is a model of cloud computing in which the vendor provides web and mobile application developers with tools and services to create a cloud backend for their applications. BaaS vendors typically use custom SDKs and APIs to give developers the ability to connect their applications to backend cloud storage and features such as user management, push notifications, and social network integration. Backend database – Any database that is accessed indirectly by the user. Big Data – A broad term used to describe unconventional data sets which are either too large or too complex to be dealt with using traditional data-processing techniques. Cloud Application – An application that runs in the cloud. Cloud Backup – Cloud backup is the process of backing up data to a remote, cloud-based server. Cloud Computing – Cloud computing is the delivery of information technology services over a network, usually the internet. In the cloud computing model, infrastructure, data, and software are hosted by the vendor and delivered to the user as a service, much like a utility company would deliver water or electricity. According to the official NIST definition, there are five essential characteristics of cloud computing: on-demand self-service provisioning of resources, broad network access, resource pooling, rapid elasticity, and measured service. The three main cloud computing models are infrastructure as a service, software as a service, and platform as a service. Cloud Foundry – Cloud Foundry is an open-source cloud platform as a service that was originally developed as a joint venture between VMware, EMC, and General Electric, and is now owned by Pivotal Software. Cloud Management Platform (CMP) – A cloud management platform (CMP) is a product that gives the user integrated management of public, private, and hybrid cloud environments. Cloud MarketplaceA cloud marketplace is an online marketplace, operated by a cloud service provider (CSP), where customers can browse and subscribe to software applications and developer services that are built on, integrate with, or supplement the CSP’s main offering. Amazon’s AWS Marketplace and Microsoft’s Azure store are examples of cloud marketplaces. Cloud Migration – Cloud migration is the process of transferring all of or a piece of a company’s data, applications, and services from on-premise to the cloud. Cloud Native – Applications developed specifically for cloud platforms. Cloud Washing – Cloud washing is a deceptive marketing technique used to rebrand old products by connecting them to the cloud, or at least to the term cloud. Cloud Sourcing – Cloudsourcing is the act of replacing traditional on-premise IT operations with low-cost cloud-based services. Cloud Storage – Cloud storage is a model of computer storage in which data is stored in facilities (often multiple facilities) managed by a hosting company (cloud service provider) and is accessed remotely by the user via a network. Container – A container a virtualization instance in which the kernel of an operating system allows for multiple isolated user-space instances. Unlike virtual machines (VMs), containers do not need to run a full-blown operating system (OS) image for each instance. Instead, containers are able to run separate instances of an application within a single shared OS. Customer Relationship Management (CRM) – Customer Relationship Management (CRM) applications allow a business to manage relationships with current and future customers by providing the business with tools to manage sales, customer service, and technical support roles. SaaS CRM applications, such as Salesforce.com, are very popular. Data Migration – The process of moving data between two or more storage systems, data formats, warehouses or servers. Database – A database is an organized collection of data. DevOps – An amalgamation of “development” and “operations,” DevOps is the combination of tasks performed by an organization’s applications development and systems operations teams. The DevOps software development method emphasizes collaboration, communication and integration between developers and other IT personnel with the goal of streamlining software development and quality assurance. Elasticity – In cloud computing, elasticity is a term used to reference the ability of a system to adapt to changing workload demand by provisioning and deprovisioning pooled resources so that provisioned resources match current demand as well as possible. Enterprise Application – An enterprise application is an application (or software) that is intended for large scale use by a (large) business. Enterprise Resource Planning (ERP) – Enterprise Resource Planning (ERP) software allows a business or organization to manage a suite of integrated applications which are used to collect, manage, and store data on a variety of business activities. ERP solutions are often offered as a service. Extensibility- The ability of a cloud solution to add new runtime and framework support via community buildpacks. Federated Database – A system in which multiple databases appear to function as a single entity. However, the databases typically involved in this kind of system exists independently of the others. Once the different databases are “combined”, one federated database is formed. Google Cloud Platform (GCP) – Google Cloud Platform (GCP) is a comprehensive cloud platform offered by Google, Inc. that consists of both infrastructure as a service (IaaS) and platform as a service (PaaS) offerings. Host Machine – A host machine is a piece of physical hardware that hosts virtual machines. Hypervisor – A hypervisor or virtual machine monitor (VMM) is a piece of software that allows physical devices to share their resources among virtual machines (VMs) running on top of that physical hardware. The hypervisor creates, runs and manages VMs. Integrated Development environment (IDE) – An integrated development environment (IDE) is an application that provides a programming environment for developers. An IDE typically includes a code editor, automation tools, and a debugger. Linux – Linux is an open-source operating system, built on Unix that is used for the majority of cloud services. Load Balancing – The process of distributing computing workloads across multiple resources, such as servers. In cloud computing, a load balancer acts as a reverse proxy and distributes application traffic to multiple servers in order to prevent any single application server from becoming a point of failure. Microservices – Microservices or microservice architecture is a way of designing applications in which complex applications are built out of a suite of small, independently deployable services. These ‘microservices’ run their own processes and communicate with one another using lightweight mechanisms such as language-agnostic APIs. Microservices are independently deployable and scalable, and can even be written in different languages. Microsoft Azure – Microsoft Azure, formerly known as Windows Azure, is Microsoft’s cloud computing platform. Azure was originally launched as a PaaS solution but now provides both PaaS and IaaS services. Middleware – Middleware is software that connects software components or enterprise applications. Multi-Cloud – A multi-cloud strategy is the concurrent use of separate cloud service providers for different infrastructure, platform, or software needs. A multi-cloud approach can help prevent vendor lock-in, and may help an enterprise deal with diverse workloads and partners. However, a multi-cloud approach can complicate many processes, such as security and governance, and a Cloud management platform is recommended for this approach. On-Demand Self Service – A cloud computing service model by which a customer can provision additional cloud resources on-demand, without involving the service provider. Resources are typically provisioned through an online control panel. On-Premise – On Premise technology is software or infrastructure that is run on computers on the premises (in the building) of the person or organization using the software or infrastructure. Microsoft Office Suite is an example of on-premise software because it needs to be installed on the computer that runs it, while Office365 is not, because it is accessed via the internet and run remotely. Open Source – Open Source is a development model in which a product’s source code is made openly available to the public. Open source products promote collaborative community development and rapid prototyping. OpenStack and CloudFoundry are examples of an open source cloud computing platform. Open Stack – OpenStack is a free, open-source cloud platform that is primarily deployed as an infrastructure as a service offering. Personal Cloud – An example of cloud washing, Personal Cloud is a marketing term often used to describe network attached storage (NAS) devices. A NAS device is a computer connected to a network that provides data storage services to other devices on the network. Platform as a Service (PaaS) – Platform as a Service (PaaS) is a model of cloud computing in which a vendor provides the hardware and software tools necessary to create, deploy and manage applications at scale to the user via the internet, as a service. For a more in-depth explanation, check out our article What the Heck is PaaS Anyway? Resource – In computer science, a resource is any component within a computer system that is of limited availability. Scalability – Scalability is the ability of a process, system, or framework to handle a growing workload. In other words, a scalable system is adaptable to increasing demands. The ability to scale on demand is one of the biggest advantages of cloud computing. Because SaaS applications can be accessed at any time, at anyplace, and on any platform, they have become a popular model for delivery of many business applications. A well-known example of SaaS is Microsoft’s Office 365, which provides Microsoft’s famous suite of productivity software— including MS Word and Excel— as a service. Software Development Kit (SDK) – A Software development kit (SDK), also known as a developer’s toolkit or devkit, is a set of development tools that aids or allows the creation of applications for a certain platform. SDKs typically include APIs, sample code, documentation, debuggers and other utilities. Software Stack – A software stack is a group of applications that work in a specific and defined order to achieve a common goal. User Experience (UX) –The nature of a user’s interaction with and perception of a system. User Space – The memory area of an operating system where application software executes. Vendor Lock-in – Vendor lock-in is when a customer finds themselves “locked-in” or stuck with a certain cloud service provider (CSP). Vendor lock-in is characterized by extreme difficulty in moving from one cloud vendor to another, usually due to lack of standardized protocols, APIs, data structures, and service models. Vertical Cloud – A vertical cloud is a cloud computing solutions that is built or optimized for a specific business vertical such as manufacturing, financial services, or healthcare. Essentially, a VM is a machine within a machine. By running VMs, a hardware computer can run multiple instances of the same operating system. Applications running on separate instances cannot interfere with each other, so if one app crashes, it will not affect apps on other VMs. Virtual Machine Monitor (VMM) – See hypervisor.